Along the Grand Union Canal between Lapworth (Kingswood Juction) and Birningham. On many occasions Anne and I have caught the train from Warwick to Lapworth Station, which is situated close to the Kingswood Junction where the Grand Union Canal and the Stratford on Avon Canal meet. From here we have walked the 8 or so miles back to Warwick along the Grand Union. Indeed this route, or parts of it, has been included in three of the Cancer Research “Two Canal” walks that we have been involved with. So, following the 2005 Cancer Research Walk from just outside Knowle back to Warwick, we decided it would be interesting, and hopefully pleasant, to walk the rest of this part of the canal network into Birmingham. Having studied maps and distances we decided to do the walk in two parts. Lapworth (Kingswood Junction) to Olton and then Olton to Birmingham (National Indoor Arena). I have also included a brief note of a shorter walk from Small Heath to the National Indoor Arena. From the station in Lapworth the route is south down Station Road passing the local school. At the T junction turn right, passing under the railway bridge, and soon after cross the bridge over Stratford on Avon Canal and go down to its tow path. Go under bridge and you are immediately at Kingswood Junction. From here follow the signs to the Grand Union Canal/Warwick and on reaching it cross the bridge over the link between the Stratford on Avon and Grand Union Canals and follow tow path north, passing the Navigation, Black Boy and Heron’s Nest Public Houses, before the locks at Knowle are reached. The flight of 5 locks at Knowle is about 4 miles from the start at Lapworth Station, and are the only locks passed, other than those at Kingswood Junction, before the canal reaches Olton. There are a few seats alongside these locks so it’s a good place to sit down and have a snack or drink and, if you are lucky, you may see boats going through this flight of locks. One of the Locks at Knowle. Like the first part of this route the canal continues through open countryside, although 2 miles further on it passes under the M42 motorway, before Catherine de Barnes is reached after another mile. From here the area alongside the canal starts to get more built up and the canal starts to go through cuttings. There are houses on top of some of these cuttings, which are mainly on the west (left) bank on the other side of the canal from the tow path. It is interesting to see what the house owners have done to their gardens, which have often been extended, via steep banks, down to the water’s edge. Because of the steepness some have ladder type steps to reach the water and many have landing stages built from scaffolding. However, many of these look as if they have seen better days and generally they look messy, but in fairness trying to build on such a steep gradient and then into the water must be difficult. The quality of the tow path along this stretch is much improved compared with the start of the walk and makes for very easy walking, and although the countryside has started to vanish both Anne and I found the more urban landscape interesting. To aid navigation I obtained details of distances etc. by visiting the excellent Jim Shead Website Page for the Grand Union Canal. However, it is worth noting that, although the details from the website give many of the bridge numbers, not all of the bridges have identifying numbers on them. This lack of information was prevalent as we neared Olton. Fortunately the Richmond Road Bridge (No. 84) where we left the canal had the a number plate on it. It was then left over the bridge and from here only 200 yards to reach Olton Station, where we were able to catch a train to Solihull (one about every 20 minute) to get a connection back to Warwick. The Grand Union Canal north of Olton. Distance -Approximately 7 miles from Olton Station to N.I.A. 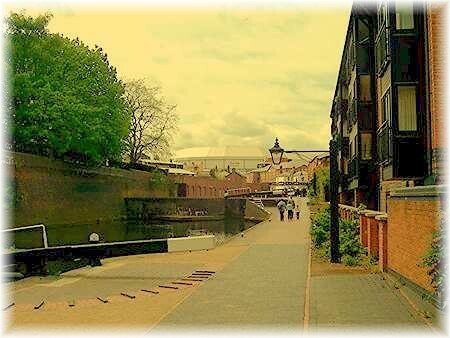 Until I did this walk I never realised that the Grand Union Canal did not go all the way to the Gas Street Basin/Farmers Bridge Junction in Birmingham but is left at Bordesley Junction. 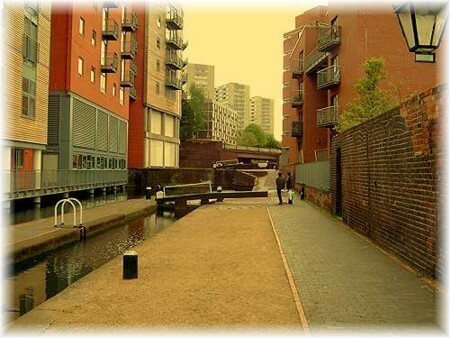 The Digbeth Branch Canal is then followed to reach the Birmingham and Fazeley Canal at Aston Junction, which is then followed to the N.I.A. at the Farmers Bridge Junction. May sound confusing but if you keep left when you reach a major junction of canals, until you reach the National Indoor Arena, then you shouldn’t go wrong. Getting to Olton was easy. Get a train from Warwick to Solihull, then from there get a connection to Olton. On leaving Olton Station turn right. At T junction turn right under railway bridge, cross over canal, go down to towpath and follow towpath under bridge. The first part of the walk of this section of the canal is without any locks. Initially houses and gardens are seen but these give way to a more industrial landscape with factories and other commercial enterprises on either side of the waterway; many of which look more like prisons with high steel fences with spikes on the top, or high walls with barbed or razor wire. This all looks a bit foreboding but it was a sunny day when we did the walk and the sun glinting on the rails etc. helped to “soften” the security provisions. would have had access canal underneath the bridge to local industry. After 4 miles we reached the Camphill Locks (6 in total spread over approximately ½ mile), where we decided to stop at a well placed bench for a snack. But we didn’t stop for long. We could see an unwelcome visitor coming our way; a Canada Goose hoping for our snack, so we moved on very quickly. Anne, a bridge and a church near the Camp Hill Locks. During the last mile or so we had started seeing these birds, which often blocked the tow path and hissed at us as we went past. Not very pleasant, but that’s only part of the story. There are currently about 61,000 of these birds in Britain and are now considered a menace as they have taken up permanent residence in parks and other recreational areas, including tow paths. It would seem that three birds can eat as much as one sheep and with a defecation rate of one “bowel action” every 4 minutes the areas they inhabit soon get covered in their unpleasant droppings. So we ate as we walked and soon, about ½ a mile further on, we reached Bordesley Junction and said goodbye to the Grand Union Canal as we followed the Digbeth Branch Canal for the next stage of our journey into Birmingham. on along the Digbeth Branch Canal. The Digbeth Branch Canal is less than a mile long and there are no locks but there is one very long tunnel below Curzon Street, which looked quite foreboding as we approached. It looked very dark inside, but it is wide and inside it is actually well lit. At this point the canal is to the east of the city centre and generally going in a northwards direction. 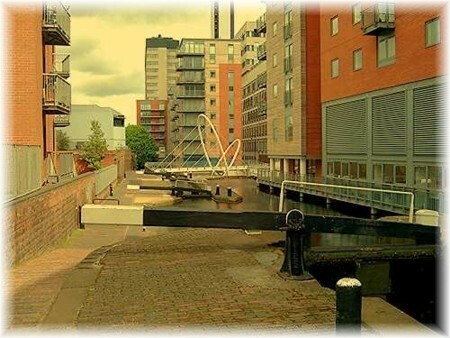 However, onnnel below Curzon Strece the Fazeley and Birmingham Canal is reached at Aston Junction - which is a few yards from the city centre end of the Aston Expressway - we follow this canal left (south west) towards our objective, the N.I.A. Looking back along the canal tunnel below Curzon Street. This is a really interesting part of the canal. Although the walk to the N.I.A. from here is less than 1½ miles, 13 locks are passed in this very built up area with many offices and other commercial buildings constructed over the canal and the small reservoirs required to feed the locks. It’s not often you see a lock under a building. Yes, this final part of the route is very interesting and well worth a visit. under one of the buildings near the centre of Birmingham. We reached the Farmers Bridge Junction outside the N.I.A. at about 1.30 p.m. and, by the time we had had a short wander around the area, office workers, who had been using the local hostelries and restaurants, were going back to work. So it was a good time to get some food and we elected – well it was the General Election on this day - to go to the Malt House Inn, where we sat by a window to watch the world go by while we had food and drink, before departing to Moor Street station to catch a train home. A view of the canal from near the the Farmers Bridge Junction. Shorter Walk – Small Heath to National Indoor Arena. 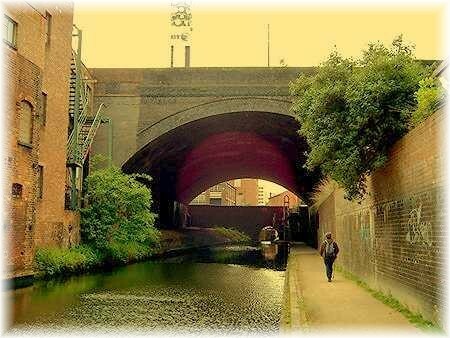 If you fancy a shorter version of this walk the Small Heath Railway Station (Three Stations after Olton Station) is less than 200 yards from Grand Union Canal Bridge (No. 89) at Golden Hillock Road. On reaching the canal towpath turn right and in less than a mile the start of the Camphill flight of locks will be reached. 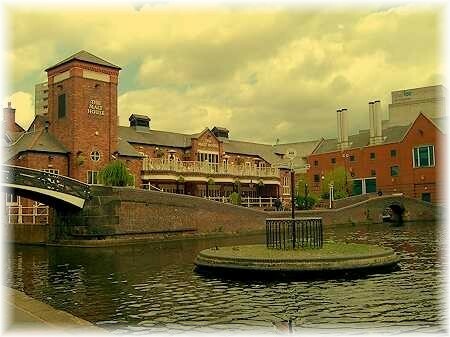 Half a mile further on is the junction with the Digbeth Branch Canal, which is followed for just under one mile to its junction with the Fazeley and Birmingham Canal. Here the route is left and in 1½ miles the National Indoor Arena and the Malta House Inn are reached. Photographs taken near the centre of Birmingham .